More than 950 supercars made Beaulieu Supercar Weekend the biggest and best yet, as 14,900 show-goers enjoyed the sunshine for a high octane celebration of performance motoring in the grounds of the National Motor Museum. With the chance to get up-close to some of the greatest and most exclusive cars ever at the A-Plan Insurance-sponsored event, there were action-packed demonstration runs and amazing displays throughout the two-day show on August 4thand 5th. Top motors put through their paces included the new TVR Griffith, latest Lamborghini Aventador, Ferrari 16M Scuderia, Bowler Bulldog, Porsche GTS, Alfa Romeo 4C, Audi R8, classic Ferrari Dino and TVR 400SE. For the first time this year, a grandstand view of the action was televised on a big screen on the Events Arena which also showed interviews with drivers. Brand new for 2018 was Supercar Evolution, which put supercars of the past alongside their modern-day counterparts for marques including Porsche, BMW, Jaguar and Ford. The 1950s Mercedes-Benz 300SL and modern-day SLS AMG turned heads with their ‘gullwing’ doors, while Aston Martin was represented by its one-time flagship model, the rare One-77, as well as classic DB5 and DB6, racing-inspired Vantage GT12 and brand new Vantage. Lightweight and powerful, the Ariel Ace motorcycle, Ariel Atom 4 and off-road Ariel Nomad were on show. Gathered on the lawns of Palace House were some of the rarest and most valuable Ferraris, with the 275 of the 1960s, F40 of the 1980s and two laFerrari hypercars flying the flag for the legendary supercar marque. Another crowd-pleasing highlight was the supercar sound-off which pitted cars against each other, with the driver of the car that received the biggest cheer receiving a Beaulieu trophy. Contenders included a Nissan GT-R, Aston Martin GT12, Audi R8, Maserati MC Stradale and Ford Mustang. Club stands played host to huge gatherings in the Beaulieu event fields, with the TVR Car Club stand showcasing a wide variety of the much-loved British muscle cars, including the Griffith, Tuscan, Chimaera, Sagaris, Cerbera and 400SE. There was another strong showing from the Lotus Drivers’ Club, including the Elan, Espirit, Elise, Europa, Exige and Evora. The Porsche Club of Great Britain stand featured a comprehensive timeline nose-to-tail, starting with the 356 and working through 911s of all ages up to the modern 911 Carrera GTS. Porsche Centre Bournemouth brought a selection of Porsches for sale, including a 718, 911 GT3 RS, Cayenne, Macan and Cayman GT4. Also taking a trip through motoring history was the Ferrari Owners’ Club of Great Britain stand, with a timeline from a 1961 250 GTE, through the 308 GT4, Mondial, 550, 360, 599 GTB, California T and 458 Italia, up to the F12. 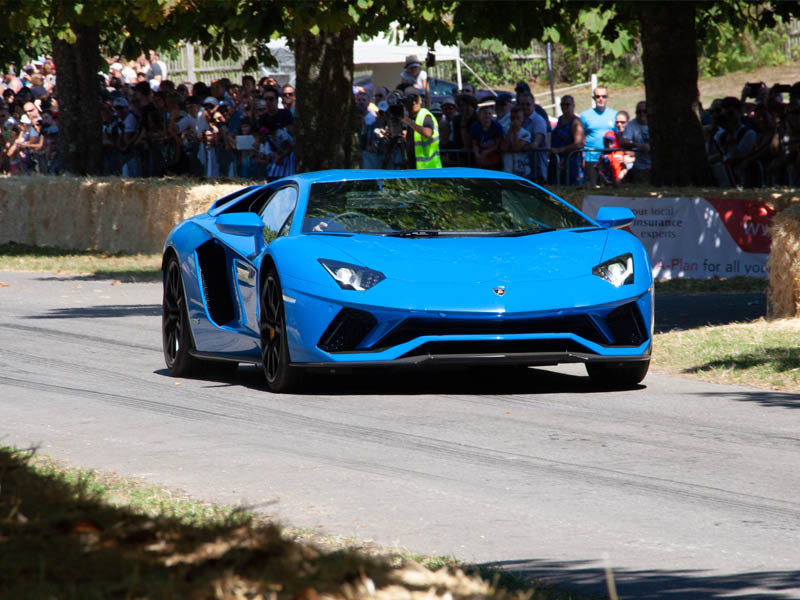 Lamborghini Club UK brought an Aventador finished in eye-catching teal with orange interior, which was surrounded by fans. Also showcasing members’ cars were The Independent Porsche Enthusiasts’ Club and Morgan Sports Car Club, while Mustangs Unleashed and Simply Mustang UK displayed Mustangs of all ages. There was even more to excite fans in the ranks of individual supercars driven into the grounds by proud owners. Radical machines, such as an Ultima Evolution and KTM X Bow, took their places alongside a Bristol Fighter, Ginetta G33, Noble M12, AC Cobra, McLaren 12C, Maserati Quattroporte and Lotus Exige 430 Cup. The SUV Secret Garden was the place to find world-leading performance off-roaders, with the Audi Q7, Range Rover SVR and Range Rover Velar, Bentley Bentayga, Jeep Wrangler JL, Ford Kuga Vignale, Maserati Levante, VW Touareg, Jaguar E-Pace, Lexus NX, RH and Volvo XC40. Tesla brought its high-performance electric cars, the Model X and Model S, while the Retro Rallycross stand was packed with historic rally cars. Honda displayed a line-up of its acclaimed Type R models throughout history, ranging from the Integra and Accord Type R of the 1990s to four different versions of the Civic Type R.
Beaulieu Supercar Weekend is part of a busy calendar of motoring events at Beaulieu, which continues with VW T Chill on August 10th – 12th and International Autojumble on September 1st – 2nd. For more details see www.beaulieu.co.uk or call 01590 612345.